There’s nothing like a porch swing on a warm summer day. A traditional New England porch swing has been resurrected by Maine-based Penobscot Bay Porch Swings in Brunswick, Me. Owner Sarah Bloy first encountered what was commonly called a Gloucester Bed Hammock when chaperoning a children’s field trip on Vinalhaven Island. These original swings were popular around the turn of the century and were crafted with sail canvas and cotton rope and contained a metal spring cot mattress. 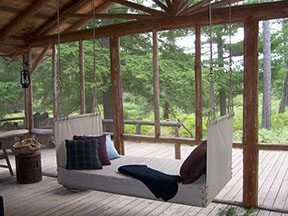 In addition to comfy, mobile seating, these swing hammocks also doubled as an extra bed for guests in the busy summer months. The bed hammocks were manufactured and sold in Filene’s and Wanamaker’s department stores up until a few years ago. Bloy decided to revive the hammock that those students enjoyed so much on the island camp porch. She entered the Marine Canvas Training Institute to learn how to work with sail canvas, and began updating and refining her designs. She noticed that on the old porch swings, significant wear occurred around the metal frame of the mattress, so she substituted a hardwood frame with a woven rope base, finished with a lightweight mattress on top. She switched from traditional sail canvas to brightly colored Sunbrella canvas, which is used in marine applications for its strength and fade- and mold-resistance. The swings are hung on polyester ropes from New England Rope that has a traditional cotton look in white and natural. The ropes are threaded through brass grommets then woven together onto large rings, which are attached with “S” hooks to hanging chains. 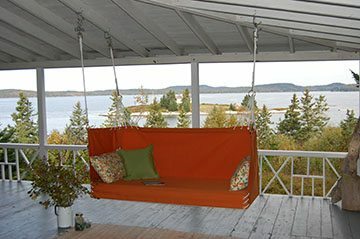 Penobscot offers three models of swings that are hung from two points, offering a more hammock-y feel: The Bar Harbor, the Camden and the York Harbor. These have open backs, low backs and high backs depending on preference and where the swing will be located. For example, if the swing is placed on an outer edge of a porch a low back or backless swing will allow the view to be fully enjoyed. A high back would shelter a person sitting on the swing from a cool breeze off the water. The second type of Penobscot Bay Porch Swing is the Kennebunkport, which attaches on four points (below left). This design offers less motion and a bit more stability. Bloy says the most popular model is their Bar Harbor, with its low back and high sides just right for lounging with a book. 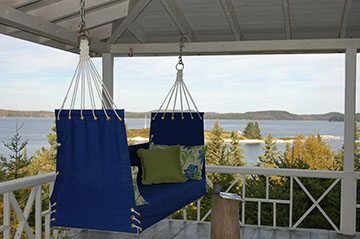 Penobscot Bay Porch Swings are available in two sizes: 74 inches by 30 inches, a large swing designed for more lounging than sitting, as the seat cushion is quite deep. The smaller size 64 inches by 24 inches, is designed primarily for sitting. 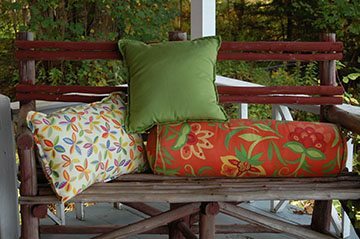 The company also offers printed Sunbrella pillows to accessorize the swings. The swings are offered in ten solid colors and can be cleaned with a bleach solution if necessary. Each swing is made to order in Bloy’s sewing shop. She’s relied on local suppliers for the elements that go into the swing construction, including the slats that stiffen the ends. Hanging the swings is simple. First you’ll need to position the swing so that it can move freely. For the two-point swings, allow 18 inches clearance behind and in front of the swing and 12 inches on either side. 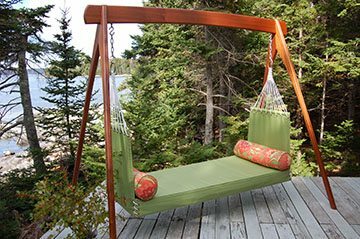 The four-point Kennebunkport swing is best suited for tight spaces, as it is less “swingy.” The swings should be hung from solid joists on porch swing hooks. If the joists do not align with the desired location for the swing, a hanging pipe can used to connect the hooks to the swing. A local woodworker, Paul Smith, of Cathedral Woodworking has also designed a freestanding swing for placement in areas without an overhead roof.